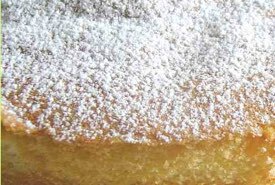 This is a traditional Chinese sponge cake recipe you'll really want to try. It makes an easy to assemble three layer sponge cake combining whipped cream, creamy custard, chocolate mousse, and colorful fresh fruit into an unbelievably light-tasting cake. The flavor and texture of this amazing dessert cake will leave people begging for seconds. † Traditional Chinese sponge cake recipes feature vanilla mousse and vanilla custard filling, but for this recipe, we're substituting a chocolate mousse. 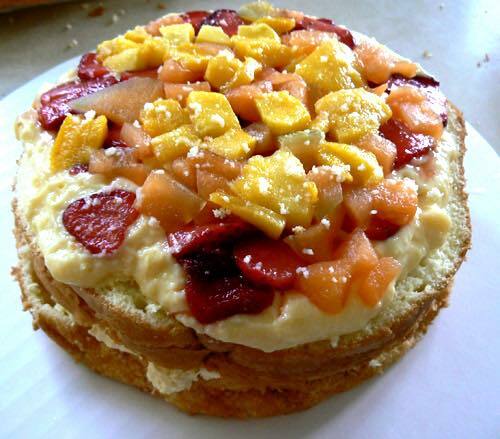 †† For this recipe, we are using strawberry, cantaloupe, and mango, but you can include peaches, cherries, other berries, canned mandarins, and more. 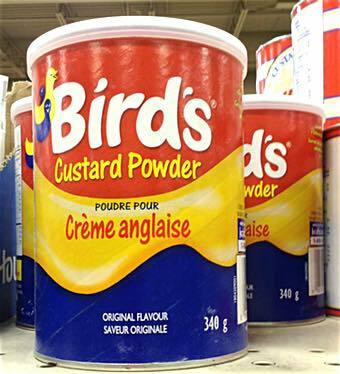 Prepare your custard and your chocolate mousse in advance according to the package decorations, then cover the bowls with wax paper and place them in the refrigerator for several hours to set. Bake your homemade sponge cake beforehand to give it enough time to cool completely. You can either use a cake mix or make one of Grandma's homemade sponge cakes from scratch. Prepare your fruit by cutting it into small pieces. You'll need enough fruit to cover 2 layers of your cake, plus enough to decorate the top. If fruit is out of season and you need to use the frozen variety, allow it to thaw and then drain any excess liquid before you place it between the cake layers. 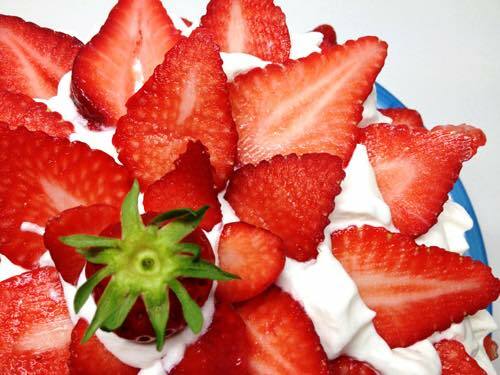 Prepare the whipped cream for your cake close to the time when you plan to assemble it. To keep your whipped cream stable for a longer time, try our stabilized whipped cream recipe. Because the stabilized whipped cream is firmer, it's easier to decorate with, and it holds its shape longer for a beautiful cake. Begin by cutting your cake twice to create 3 equal layers. 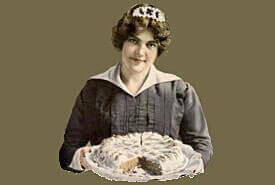 Cut your layers using a bread knife, a cake leveler, or a thread the way Grandma used to do it. You need to end up with 3 flat layers that are as even in thickness as possible. 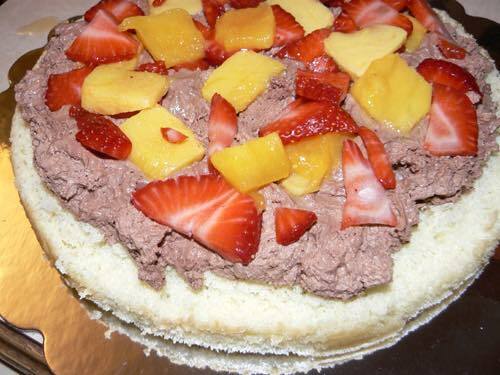 First, spread a layer of chocolate mousse over the bottom layer, and add a layer of chopped fruit as shown below. 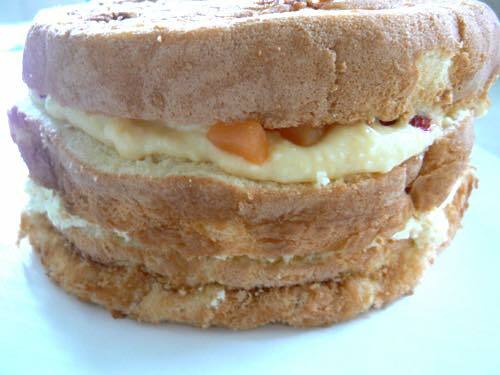 Next, add the middle layer of cake, spreading it with custard, and some more fruit as shown below. Finally, carefully add the top layer on the cake. If it becomes slightly lopsided, you can adjust for this when you add the whipped cream topping. Your topping might be a little thicker on one side, but nobody will complain. Hint: To prevent your assembled cake from becoming too lopsided, try piping a thick circle of whipped cream around the edges of the bottom and middle layers before you add the fillings. Then spread the custard and fruit evenly inside the circle of whipped cream. 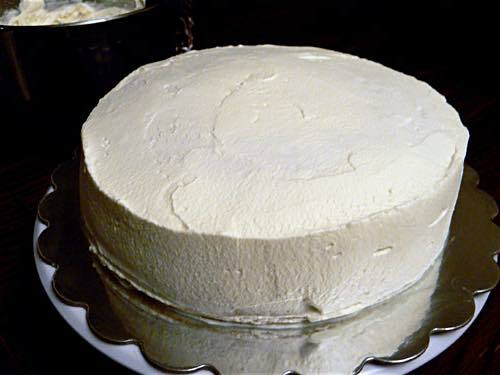 Your final step is to ice your Chinese Sponge Cake with the whipped cream (see above). 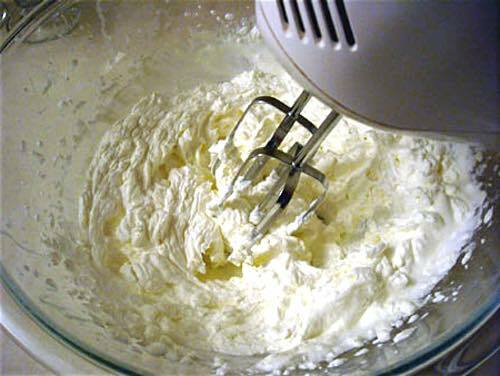 Use a spatula to spread whipped cream smoothly on the top and then around the sides, until the entire cake is completely covered. Wipe any excess whipped cream from your cake board using a clean cloth. For smooth overall icing results, a decorating turntable comes in handy. It's well worth investing in one if you plan on decorating many cakes. Feel free to decorate your cake in whatever way you prefer, but traditional Chinese Sponge Cake recipes recommend a simple decoration of whipped cream swirls, generously topped with fruit arranged in a decorative manner. Enjoy serving your delicious creation.